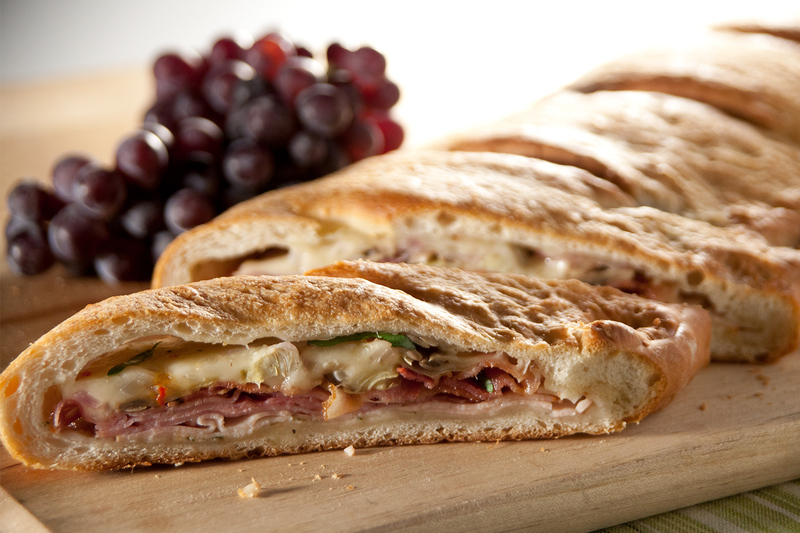 Keep everyone in your family happy, with our delicious Family Size Italian Club Calzone. Spray counter lightly with non-stick cooking spray. Combine rolls together and roll into a 10×16-inch rectangle. Cover with plastic wrap and let rest. Combine 1 tablespoon salad dressing mix with 1 tablespoon of the olive oil and set aside. Heat 1/2 tablespoon olive oil in a skillet. Add onions to skillet and saute until onions are translucent. Drain onions on paper towels and set aside. Heat another 1/2 tablespoon oil in the same skillet and add mushrooms and garlic. Saute until mushrooms are fully cooked. Drain on paper towel and set aside. Slice artichoke hearts and drain on paper towel. Remove plastic wrap from dough and brush with salad dressing and oil mixture avoiding the edges of the dough. If the ham and turkey are moist, pat dry with a paper towel. Layer half of the lengthwise dough with turkey, ham, bacon, onions, mushrooms, artichoke hearts, cheese and basil. Wet the edge of the dough with the fillings on it. Fold the other half of the dough over the filled half and pinch the edges to seal. Cut some vent holes on the top and brush with the remaining olive oil. Cover with sprayed plastic wrap and let rise 20-30 minutes. Bake at 375 degrees F 20-25 minutes.